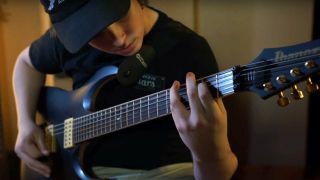 YouTuber Owen Davey, a 14-year-old from Stratford, Canada, has released his version of Dream Theater's classic In The Name Of God. The clever part? He plays all the instruments himself. "This is definitely one of my favourite Dream Theater songs," says Davey. "At around 8:00 minutes the instrumental solo section begins and is the main reason I chose the song so make sure to keep watching." Davey has previously released a number of one-man-band covers, including Metallica's Master Of Puppets (half a million views and counting), and Rush's YYZ. “Metallica would be my favourite band right now,” Davey told The Londoner. “My favourite album by them? Well, there’s a lot of really good ones. I don’t know. Probably Master of Puppets or The Black Album." Davey plays six instruments and has already partnered with various brands and studios, becoming the youngest musician to be endorsed by Ibanez. He is also endorsed by Tama.